FNF Resident Representative Siegfried Herzog and FNF Senior Administrative Officer Minnie Salao thank John Coronel. After eight years at the helm of the Council of Asian Liberals and Democrats (CALD), John Joseph Coronel has decided to leave his position as executive director. 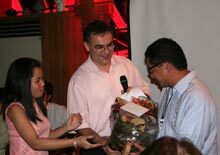 The Friedrich Naumann Foundation (FNF) bid him farewell at the opening of the fifth CALD communications Workshop in Pasig City on 18 November 2007. Coronel guided CALD through its early years. He was instrumental in forming it into a networking organization of Asian Liberal parties that is affiliated with the two most important Liberal organizations in Europe: Liberal International (LI) and Alliance of Liberal Democrats of Europe (ALDE). FNF will remember John Coronel for his effortless organization of conferences and meetings. These not only furthered policy dialogue but also served as a venue to strengthen cooperation between liberal Asian political parties and their global counterparts. CALD Secretary-General J.R. Nereus O. Acosta, Ph.D., has taken over the leadership of the secretariat in the interim.